Hagel's Out -- What About the Pivot to Asia? Chuck Hagel, despite his flaws, was an asset for the administration’s ‘pivot’ to Asia. On Monday, U.S. Secretary of Defense Chuck Hagel announced that he will resign, reportedly after pressure from President Barack Obama. The president has determined that a shake-up in the White House’s national security team is necessary amid spiraling conflicts the world over. Hagel, while more passive than he should have been on other issues, was nonetheless an important advocate of the U.S. rebalance to the Asia-Pacific. Although many observers, both partisan and non-partisan, have criticized the Obama administration for failing to deliver on its much-touted “pivot” to Asia following the departure of Hillary Clinton as secretary of state, Hagel, as defense secretary, wasn’t a weak link. In his first months on the job, Hagel set out to visit important U.S. allies at breakneck speed, revealing a passion for the United States’ defense posture in the Asia-Pacific region. When the U.S. government shut down in late 2013, forcing the president to embarrassingly miss last year’s APEC summit and cancel a broader scheduled trip to the region, Hagel carried on, visiting Japan and South Korea. As the New York Times noted at the time, Hagel’s visit to South Korea in late 2013 was “the longest stay by an American defense secretary in a generation.” At a time when the president was having trouble “showing up” in Asia, Hagel in effect became the face of the “pivot” to the United States’ allies in the region. In recent months, Hagel has overseen the process of redrawing the United States’ defense guidelines with Japan, the lifting of the United States’ lethal arms embargo with Vietnam, and the evolving U.S.-Philippines security partnership, among other issues. Hagel proved unconvincing to Chinese leaders, drawing both skepticism and criticism, but at least he was regarded as a frank interlocutor. 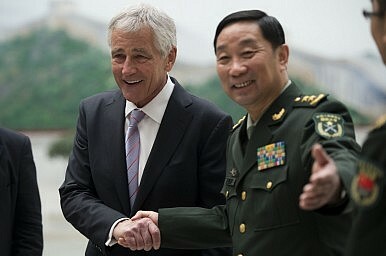 During a visit to China in April 2014, China’s Minister of National Defense General Chang Wanquan was standoffish with Hagel, vowing that China would make “no compromise, no concessions” in ongoing territorial disputes with U.S. partners in the region and warning the United States against containment. Even though the pivot experienced neither revolution nor evolution under Hagel’s leadership, it didn’t vanish altogether. The pivot’s lethargy comes down to a distracted national security team in the White House, a State Department bogged down in the Middle-East and Europe, and relative disinterest in Asia in Congress. Now, President Obama has determined that Hagel is out. November 2014 is an “appropriate time for [Hagel] to complete his service,” according to the president. Hagel’s weaknesses — namely being a White House outsider as a moderate Republican and a poor communicator before domestic audiences — have caught up with him. While it would likely have been better for the medium-term health of the Asia pivot had Hagel stuck around until the end of Obama’s second term, his departure provides an opportunity to shore up the overall cohesiveness of the United States’ often-disjointed and incoherent foreign and security policy. At the same time, however, Hagel was a known supporter of the pivot. His replacement may be more inclined to help the administration’s efforts at developing a vision for brewing crises in Europe and the Middle-East, leaving Asia out in the cold. The pick for Hagel’s replacement will send an important message about the Obama administration’s foreign and security policy priorities in its final two years. With names as varied as Ashton Carter, Michele Flournoy, Sen. Jack Reed, and even Sen. Joe Liberman (no, not really) being passed around as possible picks, it’s a long-shot that a known Asia hand or anyone with the same degree of interest in Asia as Hagel will end up leading the Pentagon. The issue of the United States’ longer term position in the Asia-Pacific doesn’t seem to pack the same short-term punch politically as the Islamic State, Russian irredentism, and even tightening defense budgets. The pivot was announced back when Hillary Clinton led the State Department, ensuring that even if Asia didn’t rank at the top of the agenda at the Pentagon, it found its rightful place in U.S. diplomacy. Her successor has been significantly less interested in making Asia his priority. With Hagel gone, the United States could for the first time since the announcement of the pivot have both a secretary of state and a secretary of defense who see Asia as a secondary national security priority. If the United States is to maintain its position in the Asia-Pacific and its broader global dominance, its leaders will have to show interest. Hagel, despite his shortcomings, did just that. For the sake of this administration Asia’s policy, his successor must do so as well. Ahead of his fourth trip to the region, Defense Secretary Chuck Hagel says the US remains committed to the rebalance.